Is your engine overheating? Most engines are designed to operate within a "normal" temperature range of about 195 to 220 degrees F. A relatively constant operating temperature is essential for proper emissions control, good fuel economy and performance. But problems can arise that cause the engine to run hotter than normal, resulting in engine overheating. Your engine's cooling system is filled with a 50/50 mixture of water and ethylene glycol antifreeze. The coolant will boil at 225 degrees unless it is held under pressure by the radiator cap. A 15 PSI radiator cap will increase the boiling temperature of a 50/50 coolant blend up to 265 degrees F. If the concentration of antifreeze to water is upped to 70/30 (the maximum recommended), the boiling temperature with a 15 psi radiator cap goes up to 276 degrees. So obviously the radiator cap plays a significant role in preventing the coolant from boiling and the engine from overheating. Anytime temperatures climb beyond the normal range, for any reason, your engine is in danger of overheating. Overheating can be caused by anything that decreases the cooling system's ability to absorb, transport and dissipate heat: A low coolant level, a coolant leak (through internal or external leaks), poor heat conductivity inside the engine because of accumulated deposits in the water jackets, a defective thermostat that doesn't open, poor airflow through the radiator, a slipping fan clutch, an inoperative electric cooling fan, a collapsed lower radiator hose, an eroded or loose water pump impeller, or even a defective radiator cap. One of nature's basic laws says that heat always flows from an area of higher temperature to an area of lesser temperature, never the other way around. The only way to cool hot metal, therefore, is to keep it in constant contact with a cooler liquid. And the only way to do that is to keep the coolant in constant circulation. As soon as the circulation stops, either because of a problem with the water pump, thermostat or loss of coolant, engine temperatures begin to rise and the engine starts to overheat. The coolant also has to get rid of the heat it soaks up inside the engine. If the radiator is clogged with bugs and debris, or if its internal passages are blocked with sediment, rust or gunk, the cooling efficiency will be reduced and the engine will run hot. The same thing will happen if the cooling fan is not engaging or spinning fast enough to pull air through the radiator. The thermostat must be doing its job to keep the engine's average temperature within the normal range so the engine does not overheat. If the thermostat fails to open, it will effectively block the flow of coolant and the engine will overheat. Exhaust restrictions can also cause the engine to overheat. The exhaust carries a lot of heat away from the engine, so if the catalytic converter is restricted, or a pipe has been crimped or crushed, exhasut flow can be restrricted causing heat to build up inside the engine. It's also possible that your engine really isn't overheating at all. Your temperature gauge or warning lamp might be coming on because of a faulty coolant sensor. Sometimes this can be caused by a low coolant level or air trapped under the sensor. If your engine is overheating, it may start to detonate. The engine may rattle and ping and lose power. If detonation continues, it may damage the rings, pistons and/or rod bearings. Overheating can also cause pisto scuffing. As the engine gets hotter and hotter, the pistons may swell to the point where there is no more room for expansion and they scrape against the cylinders, damaging the pistons and cylinders. Exhaust valves may also stick or scuff in their guides. This can damage the valves, guides and lead to a loss of compression. Another consequence of engine overheating may be a blown head gasket. Heat makes aluminum swell almost three times faster than cast iron. Thermal stress can distort the head and make it swell in areas that are hottest like those between exhaust valves in adjoining cylinders, and areas that have restricted coolant flow like the narrow area that separates the cylinders. The typical aluminum head swells most in the middle, which can crush the head gasket if the head gets too hot. This will usually cause the head gasket to leak compression between adjacent cylinders, or leak coolant into the cylinders. Engine overheating can also cause an overhead cam to seize and break. Engine overheating may also stress old radiator and heater hoses and cause they to burst under the additional pressure. Steam that is generated inside the cooling system can also damage radiators with plastic end tanks. A HOT warning lamp should never be ignored. Though a few high tech cars like Cadillacs with the Northstar engine can disable cylinders to "air-cool" the engine and keep it running at reduced power in the event of coolant loss, most engines will suffer serious damage if they overheat. So advise your customers to stop driving at the first sign of overheating. Turn the engine off, let it cool down and try to find and fix the cause before risking further travel. * Bad Thermostat -- Severe engine overheating can often damage a good thermostat. If the engine has overheated because of another problem, therefore, the thermostat should be tested or replaced before the engine is returned to service. One way to check the thermostat is to start the engine and feel the upper radiator hose (or use an infrared noncontact thermometer to read its temperature). The hose should not feel uncomfortably hot until the engine has warmed-up and the thermostat opens. If the hose does not get hot, it means the thermostat is not opening. Another way to test the thermostat is to remove it and dip it into a pan of boiling water (it should open). The exact opening temperature can be checked by using a thermometer. If the thermostat needs to be replaced, install one with the same temperature rating as the original. Most cars and light trucks since 1971 require thermostats with 192 or 195 degree ratings. Using a cooler thermostat (160 or 180) in an attempt to "cure" a tendency to overheat can increase fuel and oil consumption, ring wear and emissions. On newer vehicles with computerized engine controls, the wrong thermostat can prevent the computer system from going into closed loop resulting in major performance and emission problems if the engine fails to reach its normal operating temperature. TIP: When refilling the cooling system, air can become trapped under the thermostat. This will form a steam pocket that prevents the thermostat from opening and may cause the engine to overheat. Some cooling systems have one or more bleeder valves that can be opened to vent air from the system while refilling the system. If your cooling system does not have a bleeder valve, you can drill a small hole in the thermostat as shown. This will allow air to escape past the thermostat so it is not trapped inside the engine block. Some thermostats come with a similar feature called a "jiggle valve." There is a small hole in the thermostat with a pin that allows air to escape. * Cooling system leaks -- Loss of coolant because of a coolant leak is probably the most common cause of engine overheating. Possible leak points include hoses, the radiator, heater core, water pump, thermostat housing, head gasket, freeze plugs, automatic transmission oil cooler, cylinder head(s) and block. Make a careful visual inspection of your entire cooling system, and then PRESSURE TEST the cooling system and radiator cap. A pressure test will reveal internal leaks such as seepage past the head gasket as well as cracks in the head or block. A good system should hold 12 to 15 psi for 15 minutes or more with no loss in pressure. If it leaks pressure, there is an internal coolant leak (most likely a bad head gasket but possibly also a cracked cylinder or engine block). It is important to pressure test the radiator cap, too, because a weak cap (or one with too low a pressure rating for the application) will lower the coolant's boiling point and can allow coolant to escape from the radiator. Leaky Head Gasket -- Bad news because repairs are expensive. A leaky head gasket can allow coolant to seep into the engine's cylinders or crankcase. Symptoms include a loss of coolant with no visible external leaks, and white steam in the exhaust, especially after restarting the engine when it has sit for awhile. A leaky head gasket can be diagnosed by pressure testing the cooling system, or by using a "block checker" that pulls air from the cooling system into a cylinder that contains a special blue colored leak detection liquid. If there are any combustion gases in the coolant, the color of the liquid inside the detector will change from blue to green. A leaky head gasket can often be temporarily sealed by adding a sealer product to the cooling system. But for bad leaks or ones that cannot be stopped with sealer, the head gasket has to be replaced. Fan Not Working -- With mechanical fans, most engine overheating problems are caused by a faulty fan clutch, though a missing fan shroud can reduce the fan's cooling effectiveness by as much as 50% (depending on the fan's distance from the radiator) which may be enough to cause the engine to overheat in hot weather or when working hard. If the fan clutch shows signs of fluid leakage (oily streaks radiating outward from the hub of the clutch), spins freely with little or no resistance when the engine is off, or wobbles when the fan is pushed in or out, it needs to be replaced. With an electric cooling fan, check to see that the fan cycles on when the engine gets hot and when the air conditioner is on. If the fan fails to come on, check the fan motor wiring connections, fan relay and temperature sensor. Try jumping the fan directly to the battery. If it runs, the problem is in the wiring, relay or sensor. If it fails to run, the fan motor is bad and needs to be replaced. With a hydraulic cooling fan, the fan must be turning fast enough to provide adequate cooling at idle and low speed. Leaky Water pump -- Any wobble in the pump shaft or seepage would call for replacement. In some instances, a pump can cause an engine to overheat if the impeller vanes are badly eroded due to corrosion or if the impeller has come loose from the shaft. The wrong pump may also cause an engine to overheat. Some engines with serpentine drive belts require a special water pump that turns in the opposite direction of those used on the same engine with ordinary V-belts. It does not happen very often, but sometimes the water pump impeller can loosen up on the pump shaft and not turn, although the water pump pulley appears to be turning normally. If the impeller does not spin, there will be little or no circulation of coolant through the engine. The only way to know if this is the problem is to remove the water pump and check the impeller to see that is is tight on the shaft. Also, some plastic impellers can become severely eroded over time. 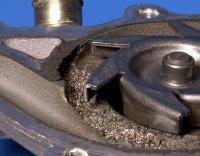 The water pump housing and/or impeller may also experience cavitation erosion. The loss of blade area or an increase in clearance between the housing and impeller will reduce the flow of coolant and can lead to engine overheating. Slipping Belt -- Check belt tension and condition. A loose belt that slips may prevent the water pump from circulating coolant fast enough and/or the fan from turning fast for proper cooling. Lower Radiator Hose Collapsing -- A pinched hose (upper or lower) or a lower radiator hose that is collapsing and blocking the flow of coolant when the engine is running can cause engine overheating. The lower hose usually has a metal reinforcing wire inside that looks like a large spring. It s purpose is to prevent the hose from collapsing when the water pump is pulling water through the hose. If this wire is missing or has failed due to corrosion, the hose may collapse. Plugged or Dirty Radiator -- Dirt, dead bugs and debris can block air flow through the radiator and reduce its ability to dissipate heat. Internal corrosion and an accumulation of deposits can also block the flow of coolant. A good way to find internal clogs is to use an infrared thermometer to "scan" the surface of the radiator for cold spots. If clogged, the radiator should be removed for cleaning or replaced. Backflushing the cooling system and/or using chemical cleaners can remove rust and hard water scale, but may do little to open up a clogged radiator. When refilling the cooling system, be sure you get it completely full. Air pockets in the head(s), heater core and below the thermostat can interfere with proper coolant circulation and cooling. If the cooling system has no bleeder valves to vent air, you may have to temporarily loosen a heater hose to get all the air out of the system. Excessive exhaust backpressure -- A clogged catalytic converter will restrict the flow of exhaust and cause heat to back up in the engine. Other causes include a crushed exhaust pipe or a collapsed double wall pipe. Check intake vacuum at idle. If intake vacuum reads low and continues to drop, inspect the exhaust system. Overheated incoming air -- On older vehicles with a carburetor or throttle body injection, check the operation of the heated air intake system on the air cleaner. If the temperature control valve is stuck so only heated air from around the exhaust manifold is drawn into the air cleaner, it may contribute to detonation and/or engine overheating. Also check the heat riser valve for manifold heat on older V6 and V8 engines. If stuck shut, it may be overheating the intake manifold. Dragging brakes -- A disc brake caliper that is sticking or a parking brake that is not releasing may be making your engine work harder than normal to overcome the friction. Check the brakes and fix as needed. Overworking the engine -- The cooling systems in many passenger cars today are marginal and have little excess capacity to handle extra heat generated by towing or high speed mountain driving in hot weather. Replacing the original stock radiator with a larger or thicker radiator can improve cooling capacity.